A binaural recording, headphone listening recommended. This soundwalk begins at Porta Nolana (where an earlier installment ended)in the Mercato neighborhood, not far from the port and the sea. 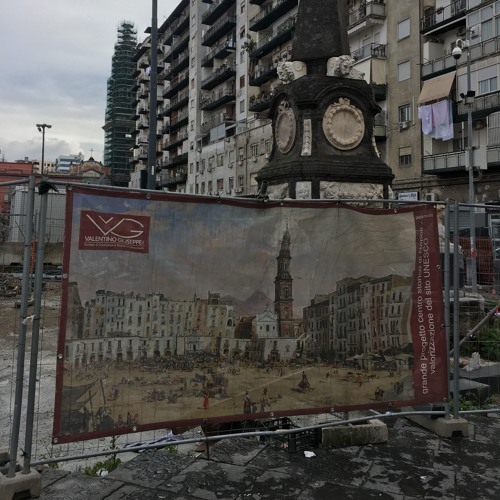 I meander through the Mercato, down alleys, in front of ‘votive edicole’, passed the house of Masaniello, around the Chiesa di Santa Croce e Purgatorio al Mercato, into the Piazza del Mercato, passted the Chiesa di Sant’Eligio, and up via Duomo to Piazza Nicola Amore. Masaniello was a young fisherman turned revolutionary who led the 1647 revolt against the rule of Habsburg Spain, who continually increased taxes on their colonial possessions to finance their perpetual wars and wasteful militarism (fighting with the French, the English, the Dutch, warring in Central Europe, and in the Americas. (The Catalans and Portuguese also rebelled in this period). Masaniello’s revolt didn’t last long, but this rebellion sparked the imagination of poets, composers, and future revolutionaries. Here, I retrace his steps and imagine the resonances with the past. Today the Mercato neighborhood is still a working-class area, and full of the sounds of cars and scooters, of shopkeepers selling goods and workshops making and fixing things, of music and birds and dogs and people yelling and all the bustle of everyday life. Towards the end, near Piazza del Mercato and Sant’Eligio, one can hear a few young Chinese girls singing songs walking to church with their father. There are fragments of music coming from cars and home stereos throughout (including Giusy Ferreri’s “Le cose che canto”). And of course the never ending symphony of voices and engines. Useless Sounds is a weekly series by Joseph Sannicandro, sharing short, unprocessed field-recordings. Anyone know the song being played?